Sean O’Callaghan Has Written A Book About James Connolly. Honestly!! Sean O’Callaghan’s infamy derives not so much from his betrayal of the Marita Anne arms shipment in 1984, as the book he subsequently wrote – The Informer: The True Life Story of One Man’s War On Terrorism – which annoyed the IRA leadership with embarrassing allegations and gossip about matters that, true or not, cast a baleful light on how the organisation did its business. Sean O’Callaghan has now written a second book, this time about James Connolly. Yes, I’m serious. James Connolly. In the same sentence as Sean O’Callaghan! Published by a Random House imprint it is to be launched next Wednesday in London, at the headquarters of Policy Exchange, a leading Tory Party think tank. 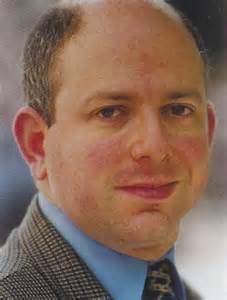 Policy Exchange, co-founded by Tory Minister Michael Gove and once led by Daily Telegraph editor Charles Moore and later by Bush adviser David Frum (he of ‘the axis of evil’ speech), is now headed by Dean Godson, biographer of David Trimble and well known for his support of neoconservative causes, not least Israel’s unrelenting belligerence towards the Palestinians, and a biting hostility to British Islam. Policy Exchange has been described by The Daily Telegraph as, “the largest, but also the most influential think tank on the right” and is said to be David Cameron’s favourite source of policy ideas. O’Callaghan played an important role fueling the British neoconservative analysis of the Irish peace process. This was based upon the idea that Gerry Adams & Co were really fooling the British, Irish and American governments into thinking they were genuine about peace while all the time waiting for the opportune moment- viz. a weakening of British will – to resume the IRA’s armed campaign. The governments were therefore foolish, said the neocons, to engage in dialogue with the Provos, just as the US government would be foolish to encourage dialogue with Palestinians, Iranians and so on. Terrorist groups/regimes were unfailingly duplicitous, should never be talked to and must always be opposed by force of arms. Imagine Netanyahu stalking the streets of Belfast and you get the idea. O’Callaghan’s role was to provide evidence of this duplicity even though it had been many, many years since he had access to the IRA’s inner councils. In truth he had no idea what was in the mind of Gerry Adams etc, but that was a minor detail. The passage of time, if not an outbreak of common sense, has demonstrated how ludicrous was this neocon analysis. A moment’s reflection would have revealed an essential truth: you never tell lies to people who are predisposed to disbelieve you. You only deceive those who think every word you utter is gold-plated truth. But what then to do with Mr O’Callaghan? After all there aren’t too many IRA veterans around who are so amenable to neocon blandishments. Might as well use him for something! Very interesting on how fanaticism can develop within a community, and especially relevant today. That comment, underlining ‘fanaticism’, makes me wonder if the purpose of this exercise is to demonstrate how James Connolly and Jeremy Corbyn are really cut from the same extreme cloth. When you consider how much ink Policy Exchange’s big fan, The Daily Telegraph, has spilled documenting the various links between the Provos and the Corbyn team, the idea doesn’t seem so far-fetched. Or, perhaps he is really talking about the similitude of James Connolly and the Prophet Mohammed. 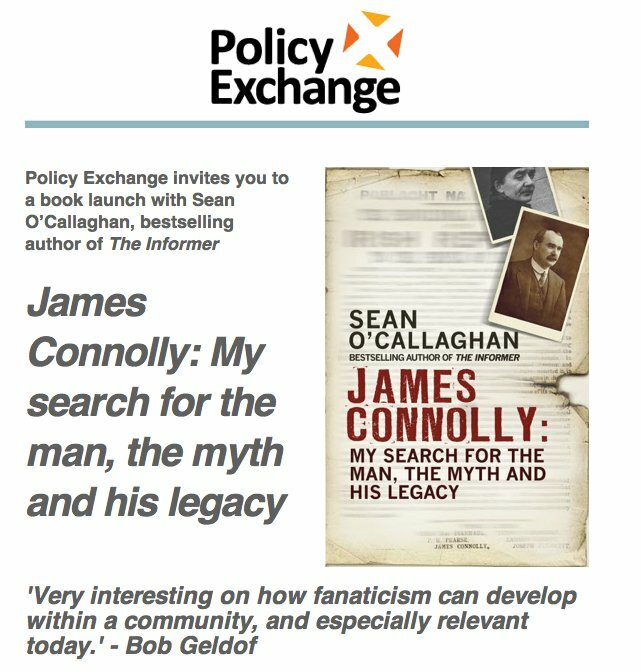 Policy Exchange is delighted to welcome Sean O’Callaghan to the Ideas Space to launch his new book, James Connolly: My search for the man, the myth and his legacy. Sean O’Callaghan, a former senior member of the IRA, described as “the most important intelligence agent in the history of the Irish State” tells the story of revolutionary James Connolly, his role in the 1916 Easter Rising, and his subsequent influence both on O’Callaghan himself, and on 20th century Irish and British politics. Sean’s talk will be followed by a few words from Dr John Bew, Reader in History and Foreign Policy at the War Studies Department at King’s College London and Director of the International Centre for the Study of Radicalisation and Political Violence. O’Callaghan gave information to the Garda Síochána during his time as the Head of PIRA O/C Southern Command, therefore it is surely disingenuous ot the writer of this article to describe him as a notorious British agent of the Troubles. why? anyone who betrays a cause, no matter what one thinks about the cause, invites the adjective notorious because in the view of those he betrayed that is what he was. in o’callaghan’s case he also was allegedly involved in the killing of another agent whose death preserved his cover – a death, incidentally, that the irish police has done nothing about. add on to that his book and the valid questions it raises about who inspired it, and even informed it, and notorious seems a somewhat inadequate adjective. you seem to be saying that because he gave information to the lawful authority of the state that meant he did not deserve the description ‘notorious’. in which case the KGB never put a foot wrong, and nor did the CIA, or the Gestapo…. I think the point Paul Mead might be making is that he would be better described as an Irish Government rather than British Government agent given that he was informing to the Garda. and whose books do you think he is on now…..? Weren’t they all working for the British at the end of the day? The murder of Sean Corcoran is one that I am always surprised about – surely it deserves further investigation, or even merits some sort of independent, official inquiry? It must be one of the few instances where there is evidence of Irish State complicity in the murder one of its own citizens; or at the very least extreme negligence. Makes you wonder how prevalent the use of informers, agents, and agent provocateurs was / is by the gardaí. I doubt he was struck dumb when he gave himself up to British police. The very fact a major publishing house has given him this book deal, and a neocon think tank is pumping it out, suggests he still has an arrangement with British intel, if I can use the word loyalty when writing about this man. Ed, how do you justify your claim that 1 in 3 volunteers were informers, it seems ridiculously high to me? By the way interesting piece. PS I read some old crap about seanie working with underprivileged kids in London, presumably when he is not helping old ladies across the road. i can’t really say much at this stage about the source for that one-in-three claim except that i believe it is sound. it also makes sense. they couldn’t move at the end without getting caught….as for being high, intelligence agencies can never have enough informers…..
no, it is not. i know who the source is and it is not him. he would not be in a position to know that level of intel…. If there is sound evidence that 1 in 3 volunteers were informers it should be placed in the public domain. What makes me doubt this number is Republican’s hate touts like the plague, and the British security services were always going to play on this. From what I know of Ian if he had evidence of the 1 in 3 claim he could not resist publishing it. I always keep in mind Yevno Azefa, as head of SR combat squads organised assassinations for his Party and worked as an agent for the Okhrana. Looking back who controlled whom might be a good question? Amongst others Azefa is said to have organised the murder of the Tsar’s uncle and Father Gapon a close favorite of the Tsar’s wife, which hat he had on at the time we do not know ;). Touts rarely if ever change the course of history. incidentally i have put the claim into the public domain, just not the source. no different from much of my journalism, e.g. ‘a secret history….’ when it is possible to do that, e.g. the reid-haughey letter after haughey had died, then it has been done. it will be the same with this. and if i was not absolutely confident, i would not publish…..
Ed, do you think the killing of informer Sean Corcoran in circumstances where it was alleged that the IRISH State was on notice of it, was a one off? The killing of informers by informers in the North has been subject to much more scrutiny – whereas the case of Sean Corcoran has been allowed to somewhat slip from view. Surely it deserves further investigation or perhaps an independent inquiry? From Sean Corcoran to the more recent inquiry by GSOC into the manner in which gardai allegedly handled an informer, shows serious issues persists in the handling and use of informers.